Each and every day I am filled with thankfulness for all the blessings in my life…especially for my family and friends. Tomorrow, on Thanksgiving Day, we will hopefully all slow down, relax, and inhale the beauty of those around us. And take some extra time to pray in gratitude and love, asking that the Lord allows us to see Him in each one of them. This is the first year we will be celebrating Thanksgiving Day without our sons. They are living across the country with their wives, in Colorado and California. It’s a weird feeling, because we miss them and wish we could spend this special holiday with them, but at the same time we are really looking forward to having a cozy and wonderful day. It will be the three of us…my husband Joe, my mother and me. Sometimes I wonder if my sons savor the memories of Thanksgiving Day in the same way I do. Just thinking of Thanksgiving brings up all kinds of memories and feelings. Categories: Family, Holidays | Tags: Family, thanksgiving | Permalink. This last weekend, I was blessed with some ‘one on one’ time with my oldest sister, Patti. We usually get to visit only once or twice a year, being that she lives in Ohio, and I am in Virginia. My mom has been living with my husband and me for over ten years now, so naturally all our visits with Patti are always together, as a family. For some reason, I felt compelled to see my sister, and spend time with her alone. There was no question in my mind…I needed her. Just like I did throughout my childhood, and then as I grew to adulthood. So, let me tell you a little about Patti. She was a beautiful and feisty young girl, who now describes herself as a tomboy who loved climbing trees and neighborhood roofs. To be honest, she was a little mischievous. That very sweet and active little girl contracted polio when she was 12 years old. As a foreshadowing of the strength of character that would radiate all through Patti’s life, when she was suffering through the onset of the disease, the doctor was called to the house to check on her. When she realized she was to be taken to the hospital, she insisted that she would not be carried out. She climbed down the stairs on her own, saying that she wanted to do it herself, knowing she would never walk again. According to my mother, Patti never cried about her plight…which was a very different reaction than that experienced by my mom, who as a young mother, watched her daughter suffer through a horrible disease that almost killed her, and then caused her to be totally paralyzed. My mother’s heart broke for her daughter, and always wished there had been something she could have done to prevent this from happening. Even now, my mom’s eyes fill with tears as she remembers those days when Patti first got sick, how scared she was that Patti might die, and what lie ahead. The prognosis, according to the doctors at that time, was that Patti probably only had about ten years to live in her condition. Well, God had other plans. 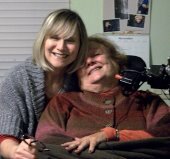 Patti is now 72 years old, and I can honestly say I have NEVER once heard her complain or cry about her ‘handicap.’ Just so you understand her condition, she can only move her right hand and her neck. 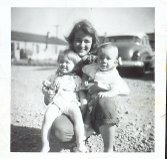 Our mom and dad took care of all of her needs; my two sisters and I also learned to care for Patti’s personal and physical needs. That is, until she moved away so she could attend Ohio State University, where she ended up earning her Master’s Degree in Social Work. You see, Patti could never refuse to “walk” through a door that the Lord opened for her. She walked by faith and the Lord blessed her life tremendously. It was not always easy for her, however, her life has always been filled to the brim! The funny thing is, I never saw my sister as ‘handicapped.’ In fact, she is the least handicapped person I have ever known. Patti is totally open to The Holy Spirit directing her life, and she always makes herself available to those around her. When Patti is with you, she is focused on knowing not only your needs, but your heart. She has a way of reading between the lines; she is an edifier, always loving and supporting in any way she can. She has touched so many people’s lives, and is loved by so many, that it boggles my mind. Being with her this last weekend was a Godsend to me. I was once again reminded of all the ways my sweet sister impacted my life…through all the stages I went through, the joys and the struggles. When I climbed up on her hospital bed, snuggling up against her as she read my favorite stories and poems over and over again. She never refused when I asked her to read to me. When I headed straight to her room after school all the way up through high school, unloading the highs and lows of my days. When I needed advice about friends or boys, and then later on as I was struggling in my marriage. When I started to question my faith, and did not understand why my life seemed so hopeless. She always gave me hope, and always shared her faith with me. When she shared my joy as I became a mother; and as she loved my sons and enjoyed the time spent with them. When she overlooked my selfishness, impatience and misdirection…always just loving me through everything. Mostly, just by being present; in the moment. So, as we visited, the time flew by. There is so much in our hearts to share with each other, and really only had hours to connect. And connect we did. I realized that my sister is truly a saint. I am not saying that lightly, and being the humble person that she is, Patti will most probably not agree with my assessment. My life has been richly blessed with the privilege of having Patti for my sister. Through her journey, which she travels completely trusting the Lord in every way, I have learned faith, hope, and love. I am learning to bloom where I am planted, and never to compare myself or my personal journey to others. To just be me…the person that God created me to be. I have learned that God works great things through all things. Patti’s life, which has been filled with great adventure and much love, shows us that the Lord works beauty through any situation we may find ourselves in. All we need to do is open our hearts to Jesus, allow His Spirit to flow through us, and then trust that He is working through us. The amount of hearts touched through Patti’s life is not even measurable; his love exudes from her. Patti, your life is a prayer! And thank you for covering me, and all the ones that the Lord has entrusted to you, with the light of that prayer. Categories: Choice for Life and Love, Christianity, Family, Gratefulness, Trials and hope | Tags: character, Faith, handicap, Holy Spirit, love, polio, Prayer, sisters | Permalink. When our hearts are opened to the reality of true poverty in this world, we want to help in any way we can. Mission trips open eyes to the poorest of the poor, and documentaries or commercials that spotlight a poverty that is entirely out of our daily realm, burn inside our spirits. We look for ways to help…whether it be sponsoring or adopting a child, donating money, providing clothing and necessities, or offering service, prayers and love. We know that through the Holy Spirit, there is some way each of us can help. But how many times do we see, know, and feel the call to love through sacrifice, decide to take action…and then allow that decision to fade away? You know what the Lord is calling you to do. What are you waiting for? The time to clothe, feed, educate, shelter, heal, pray, love is NOW! No matter how small you feel your contribution is, take that step NOW! We are the Body of Christ. Our love and all the blessings in our lives are meant to be shared. They will know we are Christians by our love. Are we sharing Christ’s burning love with this very needy world around us, or are we merely quoting Bible verses? Are we seeing the poverty of spirit in the empty eyes and lives of those who pass us each and every day? Unless we ask that the Holy Spirit guide us to see with His eyes, and love with His heart, we might miss seeing the eyes that are silently crying out for help. The eyes that try to fool the world into thinking they are happy, when on the inside, they are lonely, empty, and devoid of faith and hope. Only Jesus can fill the needs of true poverty. Only Jesus can infuse us with perfect love and mercy…overflowing our hearts to share that Divine Love with those suffering souls. He is waiting for us to invite Him to work in us and through us. What are we waiting for? Always remember…they will know we are Christians by our love. If I could speak all the languages of earth and of angels, but didn’t love others, I would only be a noisy gong or a clanging cymbal. If I had the gift of prophecy, and if I understood all of God’s secret plans and possessed all knowledge, and if I had such faith that I could move mountains, but didn’t love others, I would be nothing. If I gave everything I have to the poor and even sacrificed my body, I could boast about it; but if I didn’t love others, I would have gained nothing. Categories: Catholicism, Christianity, God's Whispers, Somebody Loves Me | Tags: Blessings, Christians, jesus, love, mission trips, poverty, sacrifice, sponsor a child | Permalink.